The nursery is situated on the B1113 between Stowmarket and Finningham at Cow Green, Bacton, IP14 4HJ. Click on the link below for a map. 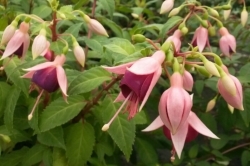 Pre-ordered plants can be collected from the nursery, but it is ESSENTIAL that you ring to make an appointment to avoid a wasted journey, as we cannot guarantee our attendance otherwise. If you wish to take advantage of this service please contact the nursery by telephone so that we can check availability and arrange a mutually convenient time. Click here to see where we are on Bing Maps and enter "Potash Nursery, IP14 4HJ" into the search function.